Founder and director of Swing ConneXion in Montréal, QC, Zack Richard is one of the most versatile dancers on the floor: not only does he excel in swing dances (Lindy Hop, Charleston, Balboa, Shag, Fake Coast Swing) but he’s always absorbing dance forms old and new (Ballroom, Tango, Salsa… still working on his Twerking). A swing instructor for more than ten years, he’s been all around the globe, spreading the joy of dancing to everyone who will listen. 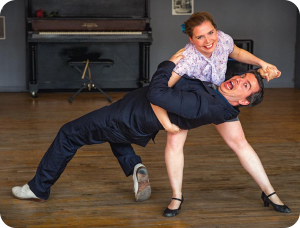 His sincere love of Chaplin and the silent movies has lead him to conceptualize the show It Don’t Mean A Thing , mixing live music, swing dance and silent comedy for the joy of all, also starring his 9-year-old daughter Camelia. When he feels like using big boy words, this jack-of-all-trades is also the author of the Jazz Monkey blog. An infinite source of positive energy, Lunou Samson-Poirot (Montréal, QC) hails from Québec City where she still trains students to this day—that’s how much dedication she has! A teacher by profession, she always brings out the little detail that will make you go “aaah!” Generous of her passion, Lunou is always eager to help and inspire others in finding their way. She feels lucky to be part of the Cat`s Corner family since 2011 and share her passion with all the dancers. She was a key factor in the success of the two first full swing dance shows in Canada: Swing Station and It Don’t Mean A Thing . This globe-trotter at heart never misses a chance to travel abroad, and she counts the social dance floor as one of her dearest friends. Dancing together since January 2013, Zack & Lunou immediately found each other through a common form of love for everything crazy and goofy. They made their style differences one of the key components of their dance relationship, and are always keen on both pushing the envelope and keeping the roots of the dance in Authentic Jazz movement.